The awards and reviews below are provided by independent third-party sites. 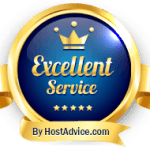 Our numerous awards demonstrate the fact that GlowHost is one of the best hosting services that you can invest your hard earned money and valuable time with. Our strong growth and longevity (circa 2002) as a service provider in the web hosting industry reflects the fact that our hosting services are targeted for customer satisfaction and retention. These awards show our ongoing commitment to service, quality, and value. Our track record has spoken for itself over the past several years and continues to shine as we grow and move forward. We have far too many awards from the past to list here, but here are some of the most recent. 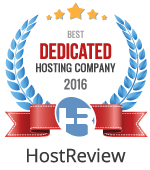 HostReview.com awarded us Best Dedicated Hosting Company of 2016. GlowHost was named the Fastest Web Host from DailyHosting.net. They say “Glowhost is hands down one of the best web hosting service providers. They have a highly qualified team to handle any thing a customer ever needs.” See the full review here. GlowHost received the Editor’s Choice Award at FindMyHost for the best reseller hosting provider. GlowHost continues to be an leader in the reseller web hosting industry, and we are extremely pleased to receive yet another award in recognition of this. GlowHost received the Editor’s Choice Award at FindMyHost for the best secure hosting provider. GlowHost’s secure web hosting services are trusted by businesses and merchants from across the globe. GlowHost received the Editor’s Choice Award at FindMyHost for the best cPanel hosting provider. GlowHost’s cPanel hosting and support is extremely honored to receive this award. GlowHost has received THREE Top 10 awards from Hostreview.com recently in addition to several others over the years. The most recent – Top 10 Overall of all hosts on the Internet. We were also recently rated as a Best Reseller Web Host and Best VPS Web Host. GlowHost was selected as a best web hosting provider from DedicatedServerDir.com and WebHostDir.com. In August of 2008 we received an award for the Best Reseller Web Hosting service. In 2009 we were ranked Most Popular Shared Web Host and then received the Most Popular Dedicated Web Host award in July of 2010. Again, in January 2012 we were voted most popular in the dedicated server category. We didn’t put that last award up here, but you get the point. GlowHost has been selected as an approved host by FindMyHost.com and WebHostReportCards.com. We are happy to announce that we received all A’s on our report card. We have a great money back guarantee (several of them actually) so you don’t have anything to lose by checking us out. GlowHost has 5 stars by customer review on Alexa.com, a major search engine indexing service. Sign up today and see why more and more customers are making the switch to GlowHost. GlowHost received high marks as well as Editor’s Choice at CloudWedge.com. We’ve been tried and tested and the verdict is in! GlowHost has excellent service! We’ve received this award for our service quality, response time less than 20 minutes, and 24/7/365 availability. GlowHost has been tested again by HostAdvice.com and the results are in! 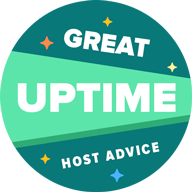 GlowHost has great uptime! We’ve received this award for our service reliability and uptime. Read our most recent GlowHost reviews powered by Shopper Approved You can’t fudge independent reviews hosted on a third-party web site, so you can be assured the information is accurate and comes from a well-known and trusted third-party ranking service.